A storming sack of battle kit for little Power Rangers. Crack codes. Tackle missions. Get the power! This bumper bag of superhero fun has everything a little warrior could want: colouring, stickers, puzzles and heaps of fantastic missions to complete. Even better, you get all the kit in a handy carry folder that lets you play the hero wherever you go! 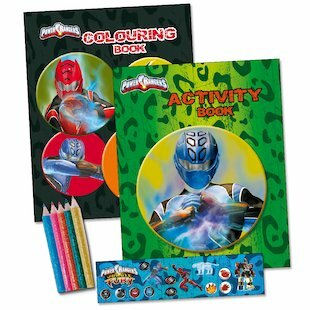 Contents: Zip file with an activity book, a colouring book, stickers and five colouring pencils.